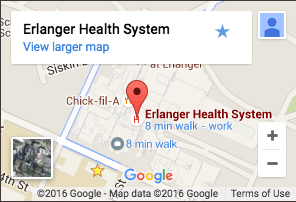 Emergency Rooms Erlanger Health System staffs 6 Emergency Departments that serve children and adults in the East Tennessee region. For more than 20 years, the Erlanger’s pulmonary rehabilitation program has been helping people with restrictive lung impairments lead more active lives – with improved strength, well-being and confidence. Exercise – We prescribe an exercise program for all participants and tailor it to meet your individual needs. The goal of pulmonary rehabilitation is to improve your endurance and helping you control your breathing. Education – Through individual and group education sessions, we teach you how to manage your condition so you will stay healthy and active long after you complete the course. Topics include breathing techniques, medications, nutrition, relaxation, oxygen, travel, and more. Support – Our program gives you the opportunity to meet people who have many of the same experiences, questions and feelings that you do. How Often Does the Program Meet? The program meets 2-3 times a week for 36 sessions. After completion of the regular sessions, many participants continue with our maintenance program, to help sustain the progress they have made. The Erlanger Pulmonary Rehabilitation Program is directed by a team of experienced professionals including a pulmonologist, nurse, respiratory therapist, exercise physiologist, behaviorist, pharmacists and dietician. Our team will work closely with you and your physician to design a program that meets your special medical needs. Your participation in pulmonary rehabilitation may be paid by your private insurance plan. If insurance is other than a private plan, the staff will be able to assist you with any questions you may have. To enroll in the program, you will need a physician’s referral. Any patient with COPD or other lung impairment may be considered for the program and early referral is encouraged. If you feel you could benefit from the program, ask your physician for more information or call the Erlanger Pulmonary Rehabilitation Program at 423-778-9400.